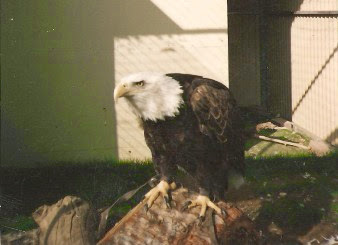 Being Mindful of those who are unable to speak for themselves; our Non-Two Legged Relations and the Future Generations. It's about walking on the Canka Luta Waste Behind the Cannunpa and the ceremonies. It's about Mindfulness and Respect. It's about Honesty and owning up to my foibles. October 17 2017, 3:50 p.m.
HOW WHITE AMERICANS view their country — and their president — appears to be almost split down the middle. In a recent Gallup poll, 49 percent of white Americans said they do not approve of President Donald Trump’s job performance. Anecdotally, the number sounds high, and I suspect it’s because far too many white Americans have a passive, almost silent disapproval of Trump. They might disapprove, but they aren’t saying so out loud; they simply don’t use their voices, their influence, or their privilege to call Trump out the way he truly deserves. Enter Gregg Popovich, head coach of the NBA’s San Antonio Spurs. At a time when black athletes and even black sports reporters are being targeted by Trump, Popovich has spent much of the past year stepping outside of his normally reserved role to use his white privilege in ways perhaps no white man in sports ever has. 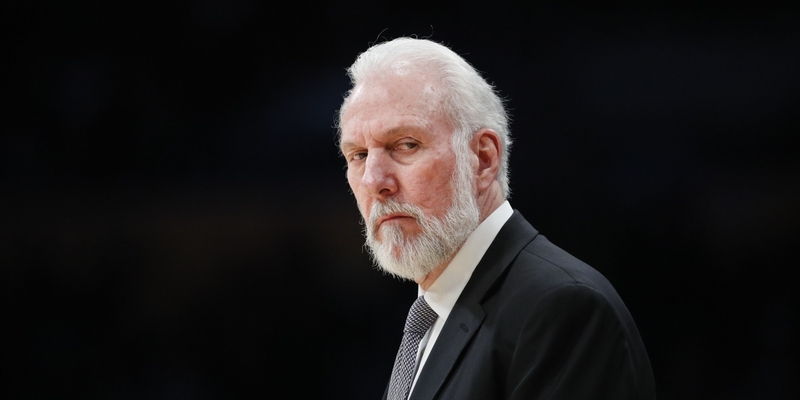 On Monday evening, in a conversation with The Nation’s Dave Zirin, Popovich decided to call Trump out with the clearest ferocity anyone could muster. Hours earlier, Trump had said former presidents Barack Obama and George W. Bush had never called families of fallen soldiers. The lie clearly incensed Popovich — himself an Air Force veteran. I’ve been amazed and disappointed by so much of what this president had said, and his approach to running this country, which seems to be one of just a never ending divisiveness. But his comments today about those who have lost loved ones in times of war and his lies that previous presidents Obama and Bush never contacted their families are so beyond the pale, I almost don’t have the words. This man in the Oval Office is a soulless coward who thinks that he can only become large by belittling others. This has of course been a common practice of his, but to do it in this manner — and to lie about how previous presidents responded to the deaths of soldiers — is as low as it gets. We have a pathological liar in the White House, unfit intellectually, emotionally, and psychologically to hold this office, and the whole world knows it, especially those around him every day. The people who work with this president should be ashamed, because they know better than anyone just how unfit he is, and yet they choose to do nothing about it. This is their shame most of all. The coach then said “bye” to Zirin and hung up. Popovich’s statement was remarkable even outside the context of the sports world. Few public figures in American life have called out Trump and those who enable him with the same ferocity. It seems like Popovich feels he has to say these things — not just because those around Trump won’t, but because he sees African-Americans ranging from Colin Kaepernick to ESPN’s Jemele Hill paying an enormous price in their careers because of Trump and his ilk. Popovich is fully aware that to be black and call out Trump comes with a cost — a cost that being white and calling out Trump does not incur. Trump has still refused to acknowledge or mention either Popovich or the white rapper Eminem — both of whom recently lambasted the president in harsh terms. Popovich is not wasting his white privilege, but is using it for good — and not just by critiquing Trump, but by promoting essential conversations on race. 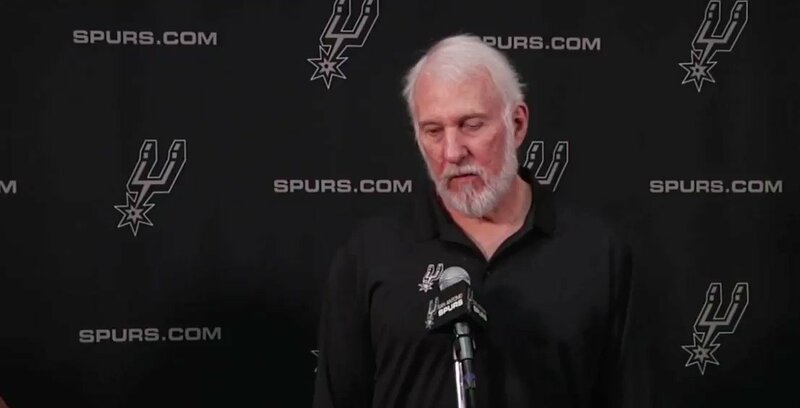 This past September, Popovich tackled the issue of race and white privilege head on. There has to be an uncomfortable element in the discourse for anything to change. Whether it’s the LGBT movement, or women’s suffrage, race, it doesn’t matter. People have to be made to feel uncomfortable. And especially white people, because we’re comfortable. We still have no clue what being born white means. … Yes, because you were born white, you have advantages that are systemically, culturally, psychologically there. And they’ve been built up and cemented for hundreds of years. But many people can’t look at it. It’s too difficult. It can’t be something that is on their plate on a daily basis. People want to hold their position, people want the status quo, people don’t want to give that up. And until it’s given up, it’s not going be fixed. I don’t just love sports — I’m obsessed with sports. And I am fairly certain that no white coach or player in the history of American sports has ever spoken with such clarity on white privilege as Popovich did right there. Period. Popovich did not get here overnight. While he has spent the bulk of his life coaching and mentoring young black men, not all sports coaches have come this far. One thing NFL coaches and general managers have taught us is that physical proximity to blackness does not necessarily amount to understanding. On the other hand, Popovich has made a personal investment to understand what he’s talking about — he has suggested in his remarks that he spends some of his spare time reading about race theory. That may explain why it has taken so long for him to speak out like this. However Popovich got here, his arrival is welcome. In America, the primary voices calling out discrimination are its victims. Just as women tend to more frequently call out sexism and Muslims tend to be the leading voices against Islamophobia, the primary voices calling out racism are African-Americans. And I get that: For the objects of discrimination, calling it out isn’t merely about justice, it’s about survival. But this is also why so little changes about the substance and systems of discrimination and bigotry in America. Until those who actually benefit most from racism, sexism, classism, and other forms of bigotry speak up and speak out, those systems are likely to remain in place. Popovich gets this. Now we need other white folks to get it, too. Top photo: San Antonio Spurs head coach Gregg Popovich during an NBA basketball game on Feb. 26, 2017, in Los Angeles. I am at a complete loss to understand how it is in this day & age that people in the United States Do NOT Have A Right to Clean Water. I do not understand how their local government officials are able to deny their poorer constituents clean water and adding insult to injury; turn off their constituents' filthy, lead-laden, toxic water when those same constituents refuse to pay for the water..... while at the same time, those same Greedy government officials allow Nestle all the Clean water it wants for basically free and then allows Nestle to turn around and sell it back to their constituents at over a 100% profit. Gina Luster bathed her child in lukewarm bottled water, emptied bottle by bottle into the tub, for months. It became a game for her seven-year-old daughter. Pop the top off a bottle, and pour it into the tub. It takes about 30 minutes for a child to fill a tub this way. Pop the top, pour it in; pop the top, pour it in. Maybe less if you can get gallon jugs. Luster lives in Flint, Michigan, and here, residents believe tap water is good for one thing: to flush the toilet. “I don’t even water my plants with it,” she said. Flint became synonymous with lead-poisoned water after government officials, looking to save money, switched the city’s water supply from Detroit city water to water from the corrosive Flint river. Once the city had switched, the number of children with elevated lead exposure doubled; residents reported unexplained rashes and losing hair. An unpublished study recently found fetal deaths in Flint increased by 58% during the crisis. With the money they make, they could come and fix Flint – and I mean the water plants and our pipes. Suddenly, Flint was a cause célèbre. The Democratic presidential candidates Hillary Clinton and Bernie Sanders held a debate in Flint. Barack Obama visited to raise morale. Americans who could afford it started ripping out old lead pipes. Media outlets across the country started examining their own towns for lead. Despite having endured lead-laden tap water for years, Flint pays some of the highest water rates in the US. Several residents cited bills upwards of $200 per month for tap water they refuse to touch. But just two hours away, in the tiny town of Evart, creeks lined by wildflowers run with clear water. The town is so small, the fairground, McDonald’s, high school and church are all within a block. But in a town of only 1,503 people, there are a dozen wells pumping water from the underground aquifer. 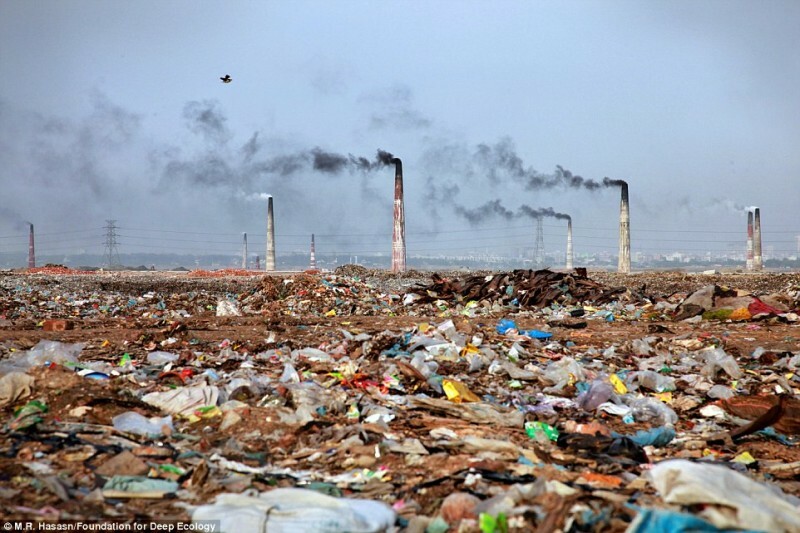 This is where the beverage giant Nestlé pumps almost 100,000 times what an average Michigan resident uses into plastic bottles that are sold all over the midwest for around $1. To use this natural resource, Nestlé pays $200 per year. Now, Nestlé wants more Michigan water. In a recent permit application, the company asked to pump 210m gallons per year from Evart, a 60% increase, and for no more than it pays today. In the coming months, the state is set to decide whether Nestlé can to pump even more. The proximity of the Nestlé plant to Flint’s degraded public water supply has some Michigan residents asking: why do we get undrinkable, unaffordable tap water, when the world’s largest food and beverage company, Nestlé, bottles the state’s most precious resource for next to nothing? Free water is not uncommon. In the US, water has traditionally been free for companies and people to use – it’s the government infrastructure that cleans and delivers people safe water that costs money. The government infrastructure is what failed in Flint. Still, in Michigan, what people have a problem with is a company bottling the state’s water and selling it back to people who, through no fault of their own, are completely dependent on it. In a state where officials denied Flint’s water was poisoned with lead; where Detroit residents choose between heat and water; where the water-borne, pneumonia-like legionnaire’s disease killed a dozen; and where gastrointestinal bugs spread among residents who lacked (or didn’t trust) water, Nestlé’s request seemed like salt on a wound. “Don’t seem right, because they’re making profits off of it,” Wolverton said, with several fresh cases of bottled water in the back of his car. Activists here, such as Luster, see Nestlé’s bottling plant and Flint’s tainted water and Detroit’s mass water shutoffs as connected – part of an “ecosystem” (as Luster calls it) meant to put water into private hands. In 2017, bottled water became the most consumed bottled beverage in North America, due in part to fears of lead-tainted water and concerns about the negative health effects of sugary beverages, analysts said. Nestlé had $92bn in sales in 2016, and $7.4bn from water alone. Nevertheless, the company pays nothing for the 150 gallons per minute it already pumps from the ground in central Michigan. The $200 per year is just an administration fee. Nestlé doesn’t bicker with the price it gets water at, but it does maintain that when it turns Evart water into brands like Nestlé Pure Life and Ice Mountain, it is being a steward of the environment. The company has 52 bottled water brands altogether, including some of the best known in the world – Poland Spring, Perrier, San Pellegrino. Many people in Evart would probably disagree, and they’re hardly alone. A small town in Canada was recently disappointed that it was outbid by Nestlé in a bid to fund a long-term water source for the town. And environmentalists in California are watching closely whether Nestlé can continue to pump water – for $524 – out of San Bernardino national forest on a permit that expired nearly 30 years ago. Further, Nestlé’s annual report does not address plastic pollution: a problem piling up at one million bottles per minute according to a Guardian analysis. Some campaigners believe plastic pollution to be the most significant environmental problem behind climate change. Studies have also begun to find plastic pollution in the food chain – in fish, salt, honey, beer and tap water. Michigan’s water conflicts, with Nestlé as a new focal point, have begun to attract broad social justice campaigns. The Rev Dr William Barber II, a powerhouse preacher sometimes compared to Dr Martin Luther King Jr for his ability to weave together left-leaning politics and Christian teachings, trained some of Michigan’s local water activists in August. Many said they were directly politicized by rolling water crises in Flint and Detroit. “One of the reasons we’re here today,” said Barber, standing backstage in a community college in Detroit, was “this water crisis”. Social justice groups focused on water in Michigan have become an increasingly powerful force. Protesters pushed for public hearings on Nestlé’s permit in January. Residents in Flint agitated for continued state support in February. Activists in Detroit blocked city contractors from shutting off residents’ water, and won a reprieve when a judge dismissed charges against them. Politicians are also entering the fray. The Michigan state representative Tim Sneller and colleagues asked the Michigan department of environmental quality (MDEQ) not to approve Nestlé’s permit. On Friday, activists from Flint will join activists from Evart, where Nestlé pumps water. They will be joined by groups from Detroit, where people are having their water shut off, from north of the border, where the social justice group Council of Canadians is based, and from indigenous communities around the Great Lakes. Together, they want to promote a “water summit” on “human rights and water sovereignty”. “When it comes to water, we should be working within the government to make that as cheap as possible,” Barber said. “Privatizing that which the lord created is just wrong”. Where Barber spoke, in Detroit, water still technically belongs to the city’s residents. But in neighborhoods where one in five homes had their water shut off last year, it is anything but affordable. Nicole Hill, a mother of three, has her water shut off every few months. It still costs “more than $200 a month”. That was in 2014, when 33,000 homes in Detroit had their water shut off. She was one of thousands who were part of a city “blitz” that shut off water to delinquent accounts. Last year, 27,000 homes in Detroit had their water shut off. Valerie Jean, a mother of five, bonded with her neighbors after her entire block was cut off from water when multiple residents fell behind on their bills. Still struggling, Jean perpetually seems to have a blue stripe in front of her home, a kind of scarlet letter painted on front yards by city workers to highlight a home’s water access point. That makes it easier to shut water off. “When they shut off a whole community, it shows water is not affordable to us,” said Jean. Barber spoke to a crowd of hundreds in Detroit, with 11,000 more people watching online. The rally was not just about raising spirits. It was part of the Poor People’s Campaign, a “moral revival” organized by Barber and his co-chair, the Rev Dr Liz Theoharis, to train impoverished Americans to be activists. Barber is a tall, stout man with a teeter-totter gait. He’s got hands the size of a bear’s and builds his speeches like a fire – nurturing a spark into a cheering, song-singing, burn-the-house-down blaze. Barber started with a cold crowd, but some were soon in tears, and answered calls in unison – “Forward together!” Barber yelled. “Not one step back!” the crowd shouted back. In April 2014, Flint switched from Detroit city water to the corrosive water in the Flint river. Luster remembers – it happened on her daughter’s birthday. She and her nine-year-old daughter (then seven) quickly became sick. By July, she had collapsed at her job as a retail manager. Even today, strange, unexplained health effects remain. Luster, 43, has had part of her uterus removed, an unexplained abscess taken from her left breast, and a lymph node removed from her right underarm and back. She has lost a five-gallon bag’s worth of hair. Now, she is a full-time organizer with Flint Rising, and is considering law school. And almost two years after the crisis made national headlines, Luster still does everything in her Flint home with bottled water – cooking, washing hands, and even seemingly innocuous tasks, like ironing. She filters bottled water to drink. All those people bitching in FEAR about having their taxes raised because other less fortunate poor people (veterans, homeless, children, Natives) get just a fraction of the help they need from the government need to pull their heads-out-of-their-arses and really look for themselves what potus 💩 and congress 🤡 are really doing w/ the budget in regards to taxes, tax-cuts, & distributions. Why are you angry & afraid of the government when they spend tax dollars helping PEOPLE In Need; especially the veterans, children & the elderly: but you're not angry that the government refuses to spend the needed money helping those people affected by poisoned water, poisoned food, and natural disasters? Why are you Not Angry at Clinton for negating the Glass-Steagall Act, which prohibited commercial banks from engaging in the Business of Investments (which means using Your money [not theirs] to make more money for themselves)? Why are you not angry at the government spending $4.79 trillion on the Middle East war(s) all based on our hostile take-over of the Middle East's oil, mineral, & opiate resources? Why are you not angry that the NFL does not pay taxes & also receives billions of $$$ in subsidies? Why are you not angry that the government uses your tax dollars to subsidize Drug Companies but angry that they subsidize Health Insurance for people who pay taxes? Stop Placing the Blame on the people in Need.... Blame your Government. Sometimes every word is superfluous. These pictures say more than a thousand words. 1. 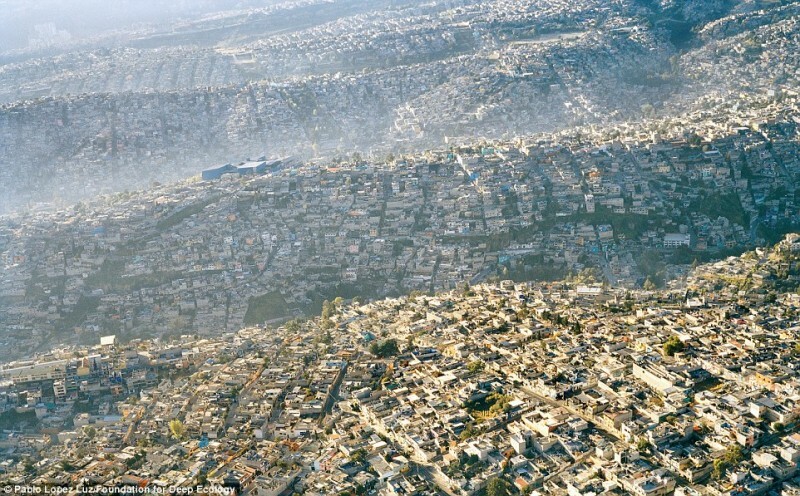 The view over the overdeveloped metropole of Mexico City (with more than 20 million inhabitants). 2. 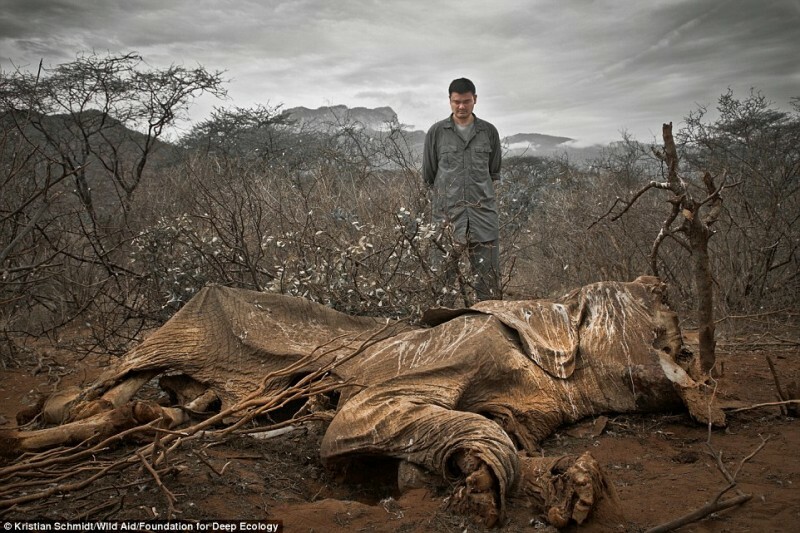 An elephant killed by poachers left to rot. 3. 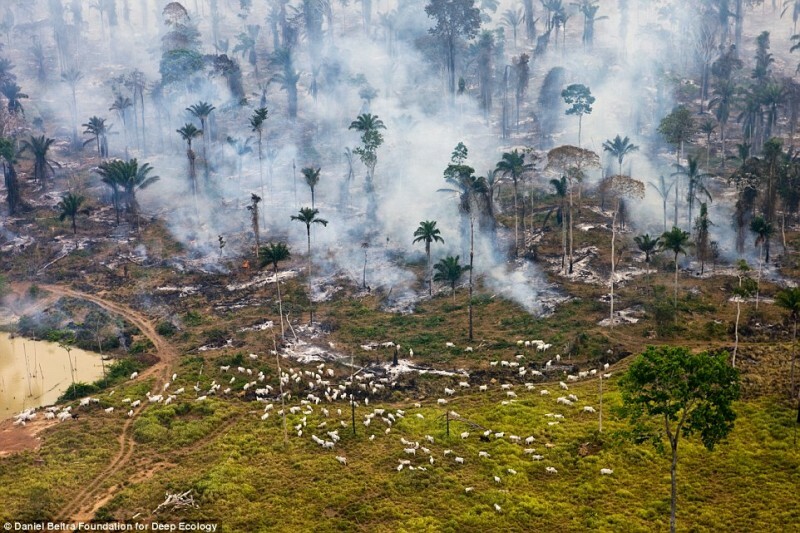 The rainforest in flames – goats used to graze here. 4. 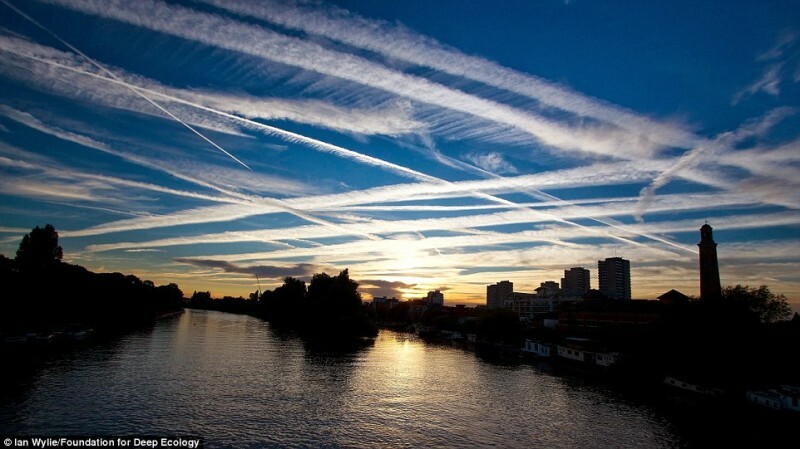 Trails of excessive air traffic over London. 5. 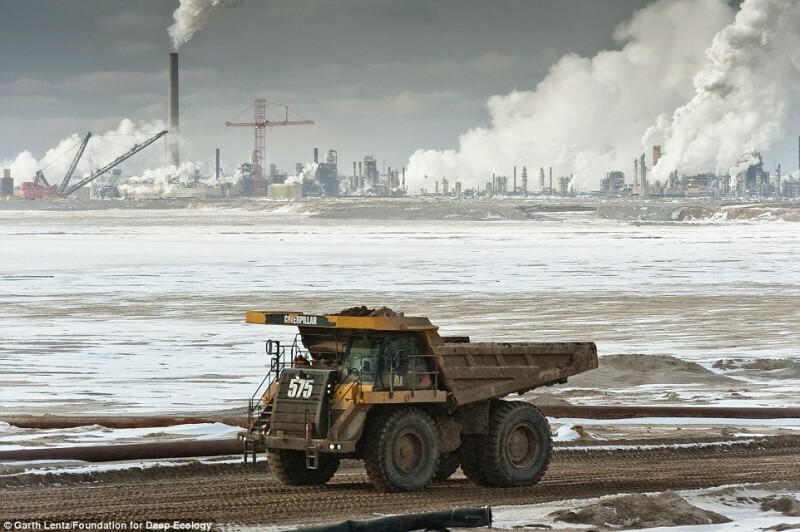 A massive truck delivers a load of oil sands for processing. Oil sand is considered the energy source of the future. 6. 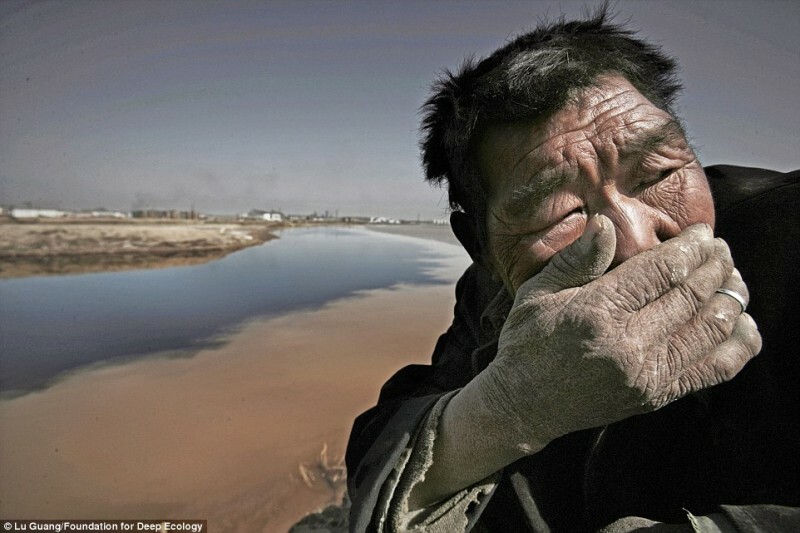 A simple herd farmer cannot withstand the stink of the Yellow River in Inner Mongolia. 8. 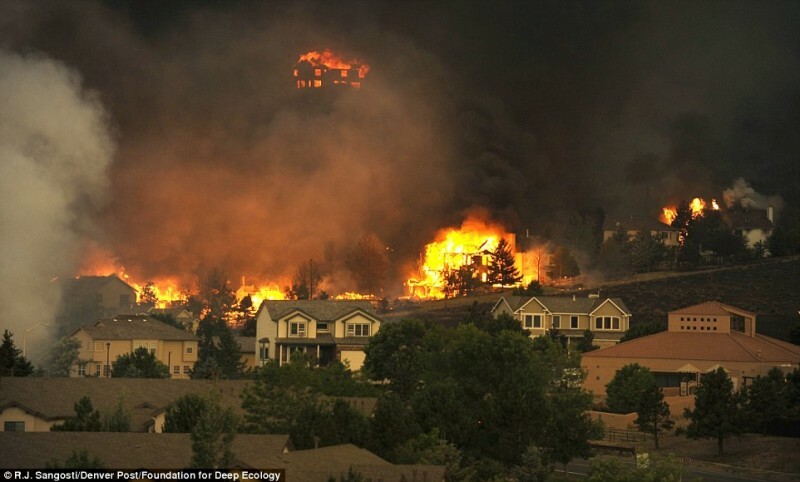 A fire storm plows through Colorado – increased incidences of wild fires is a result of climate change. 9. 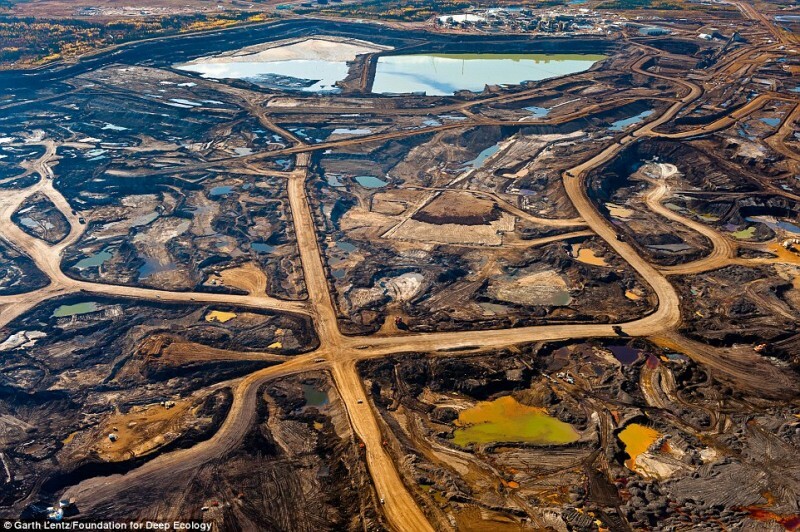 The scars left behind from the mining of oil sands in the Canadian province of Alberta. 10. 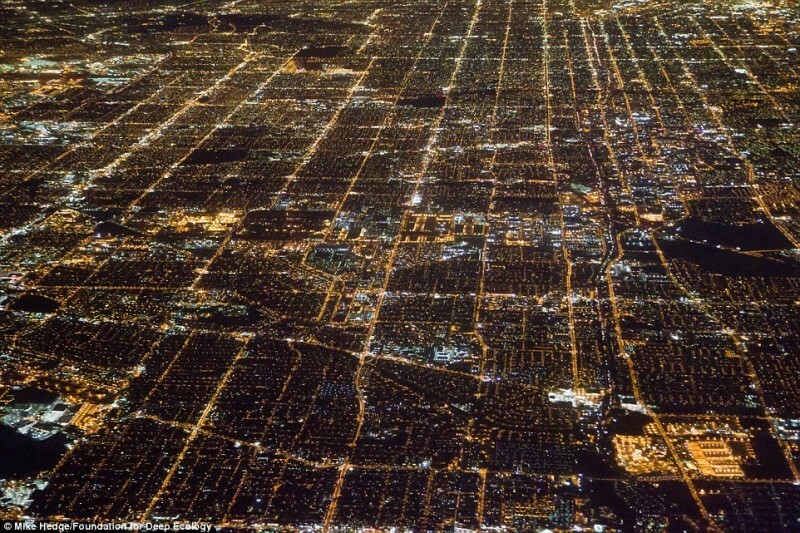 A nighttime spectacle in downtown Los Angeles – the energy demand is incalculable. 11. 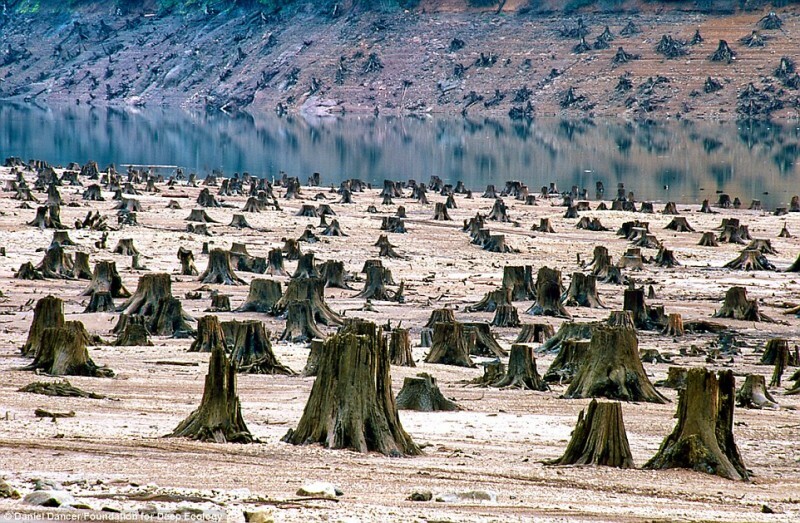 In Oregon, this thousand year old forest fell victim to the chain saw for a new dam. 12. 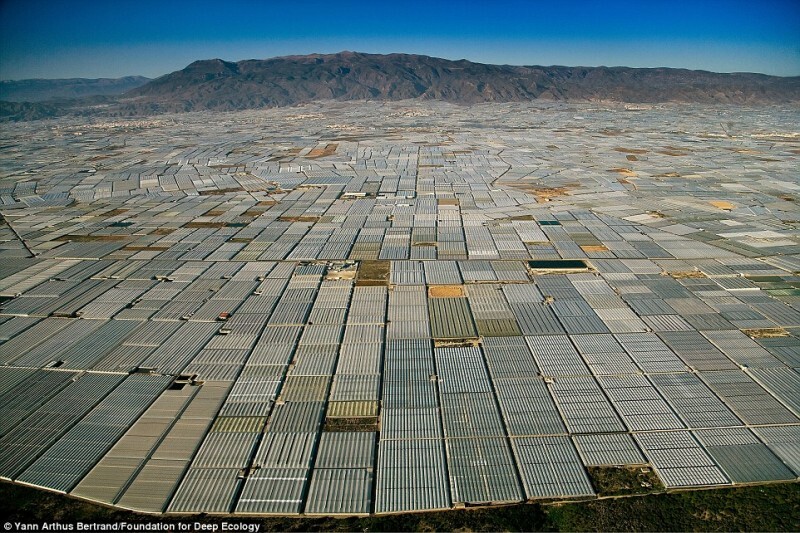 The area around Almeria in Spain is littered with greenhouses as far as the eye can see – simply for a richly filled dinner table. 13. 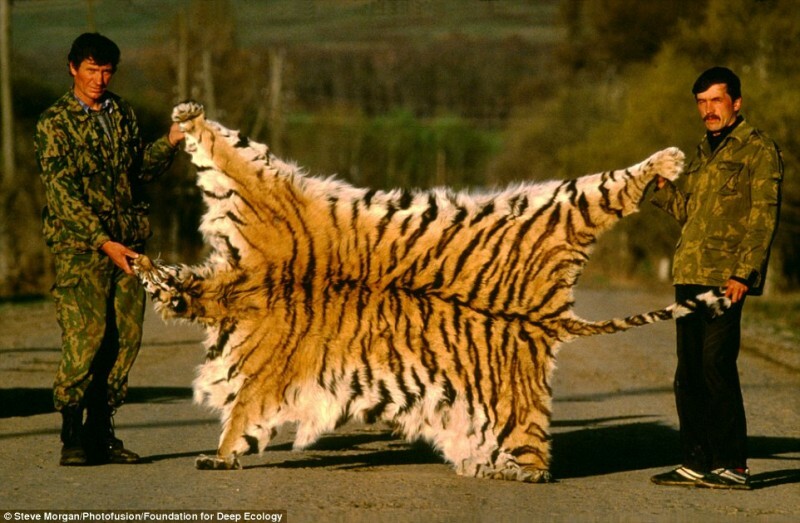 Poachers pose proudly with the coat of a Siberian tiger. 14. 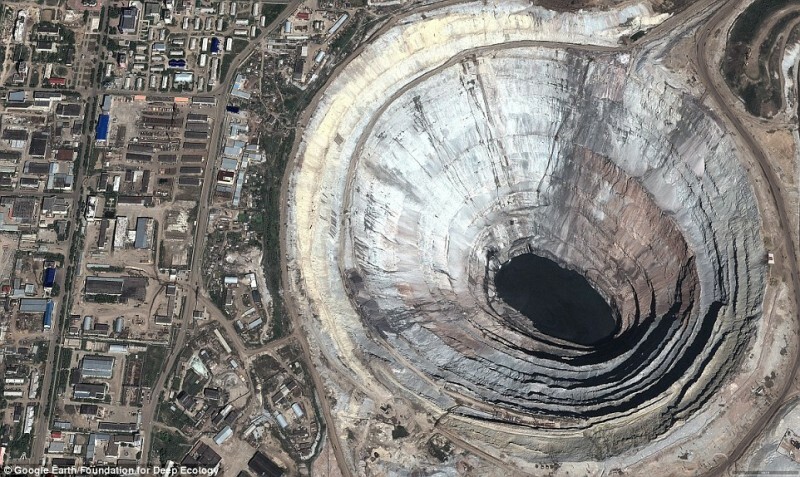 The Mir Mine in Russia, the largest diamond mine in the world. 15. 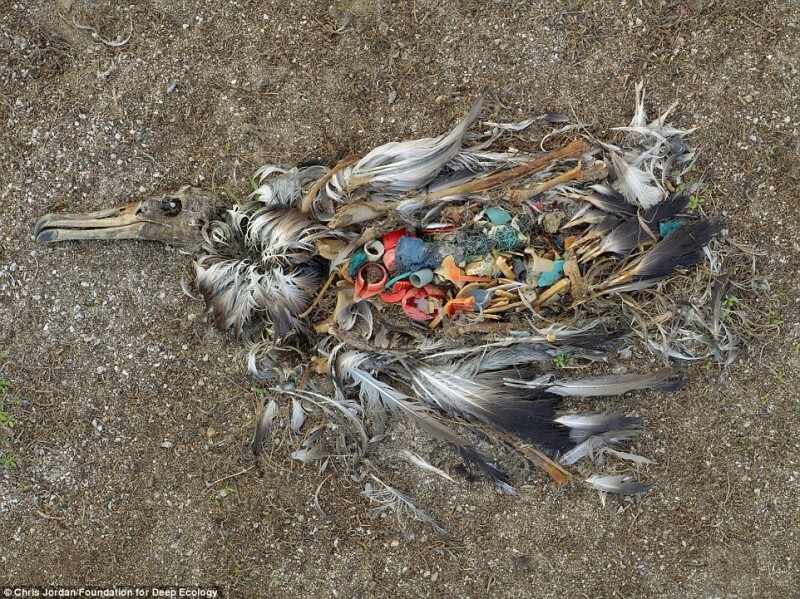 A dead albatross shows what happens when we litter. A living dumpster. 16. 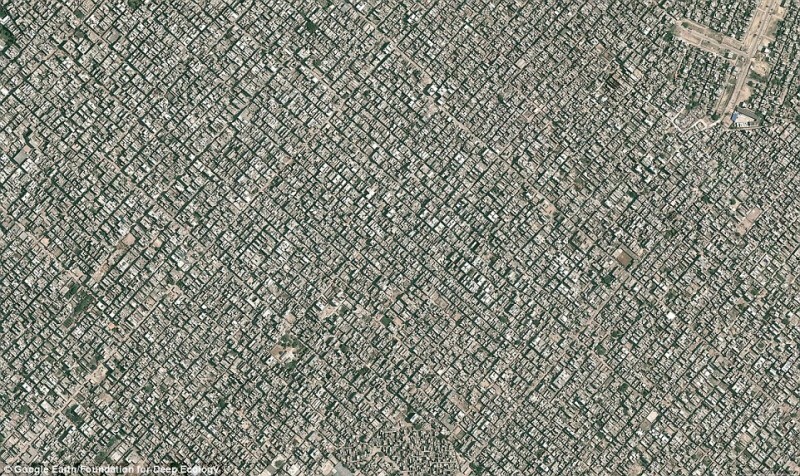 And yet another megatropolis – a bird’s eye view of New Delhi (over 22 million inhabitants). 17. 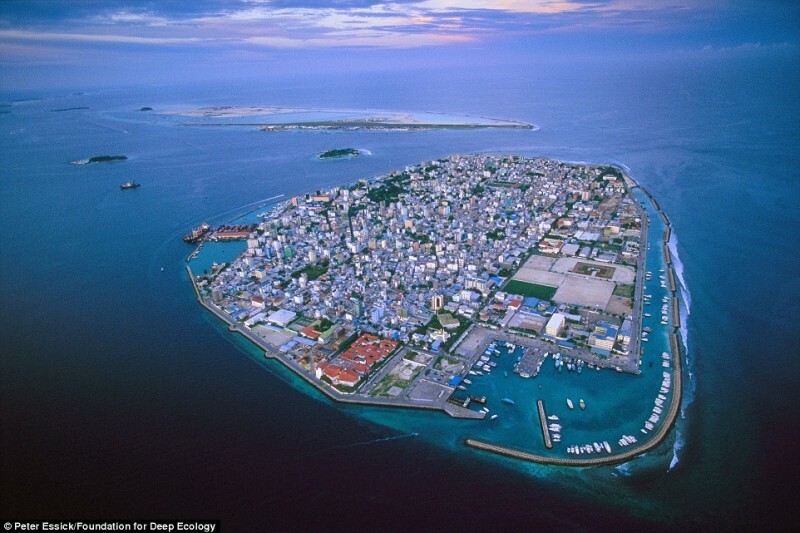 Paradise almost lost: the Maldives, a popular vacation spot that is threatened by rising sea levels. 18. 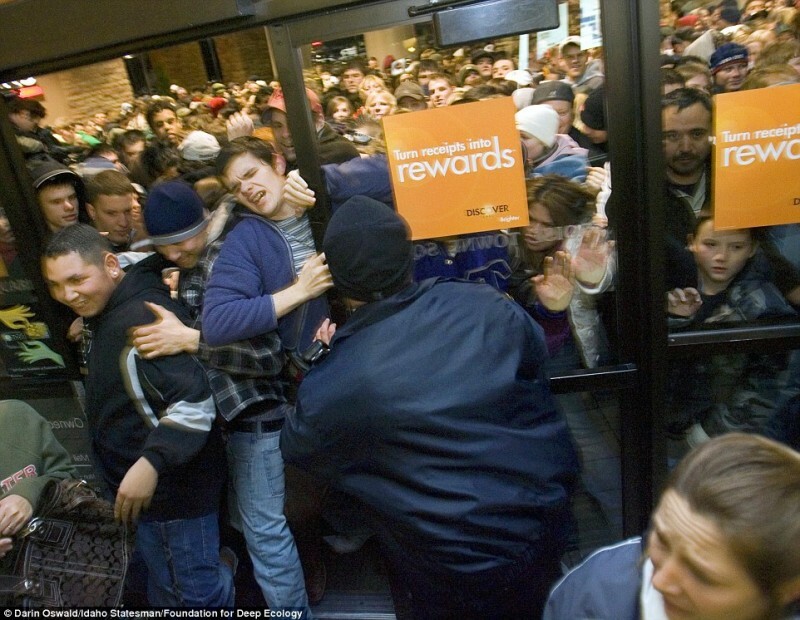 The beginning of Black Friday at an electronics store in Boise, Idaho. 19. 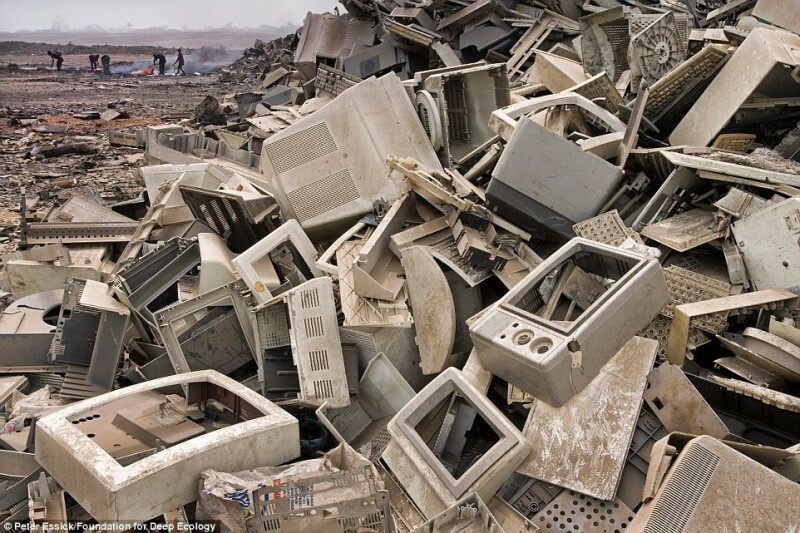 Tons (literally) of broken electronics end up in developing countries and are stripped for precious metals by using deadly substances. 20. 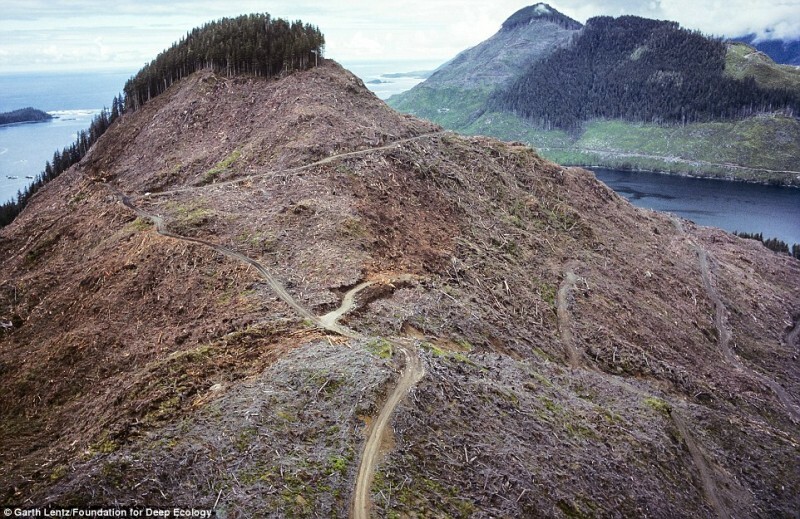 The blunder of the Brazilian rain forest is being repeated here in Canada. 21. 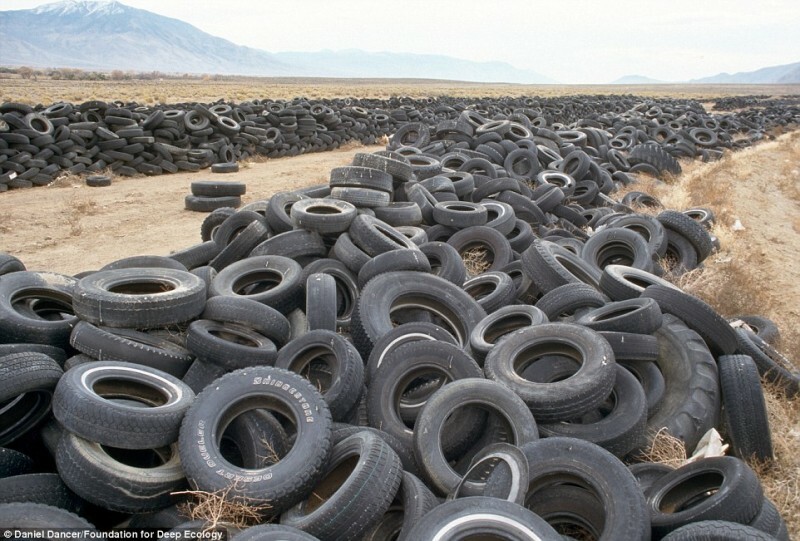 A landfill for worn-out tires in the desert of Nevada. 22. 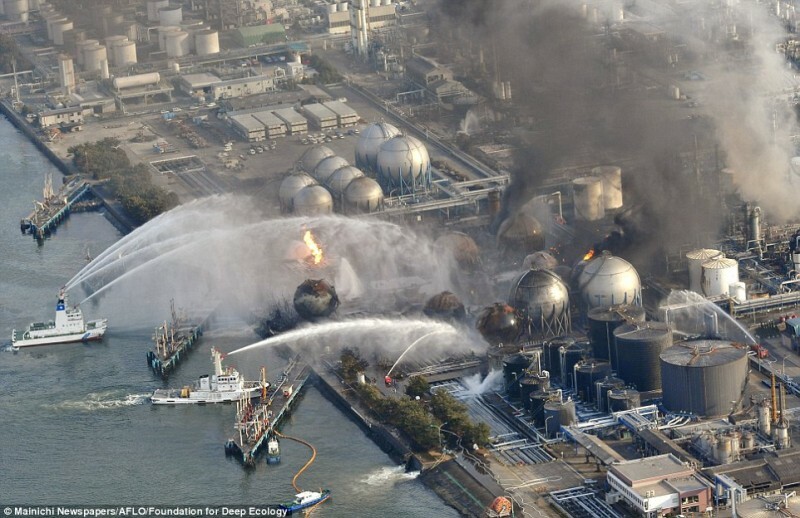 While the entire world watched the events of Fukushima, a massive heat and power station was burning just a few miles away. All attempts to extinguish it where fruitless. 23. 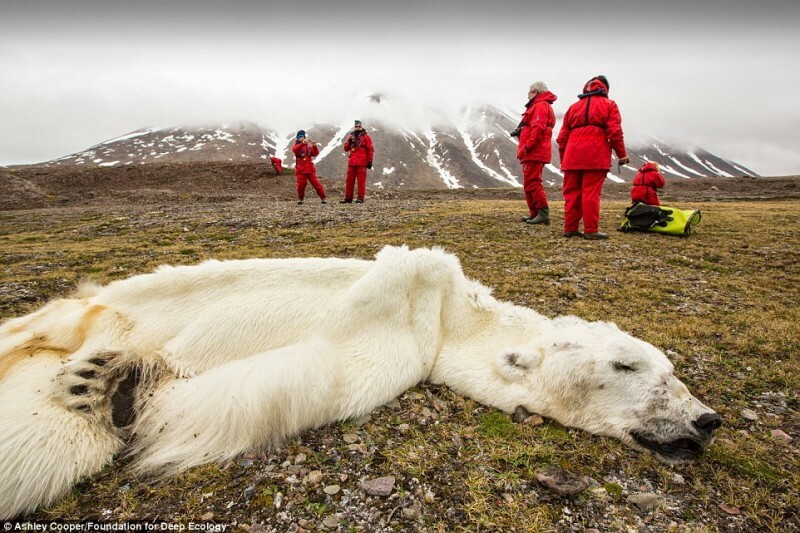 This polar bear starved to death in Svalvard, Norway. Disappearing ice caps are robbing polar bears of both their living space and food. 24. 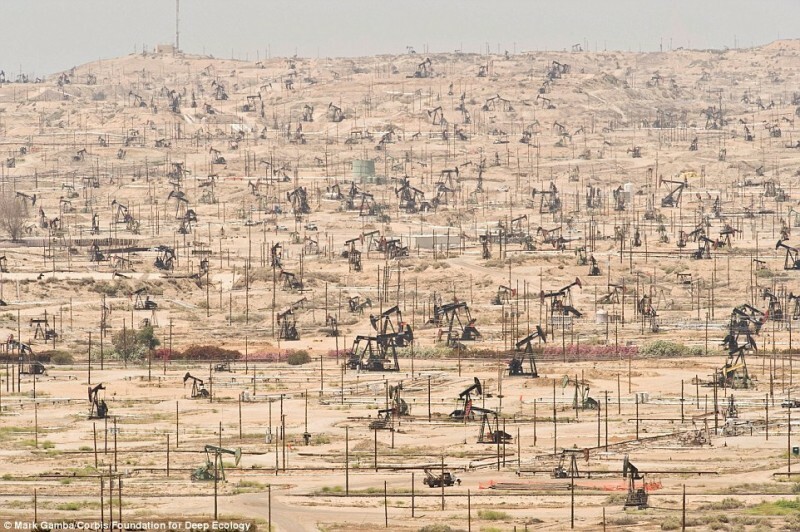 To the last drop: an oilfield in California and the merciless overexploitation of humans. 25. 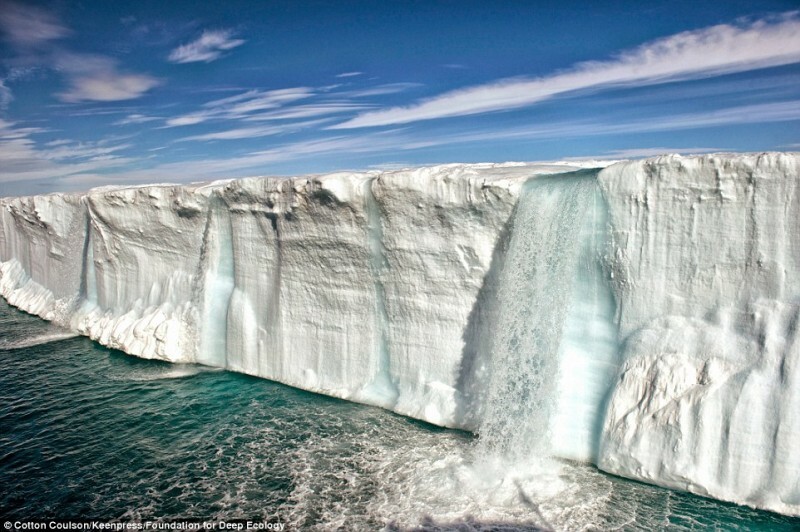 A massive waterfall from melting pack ice. These masses are the only meltwater and the undeniable proof how swiftly climate change is advancing. 26. 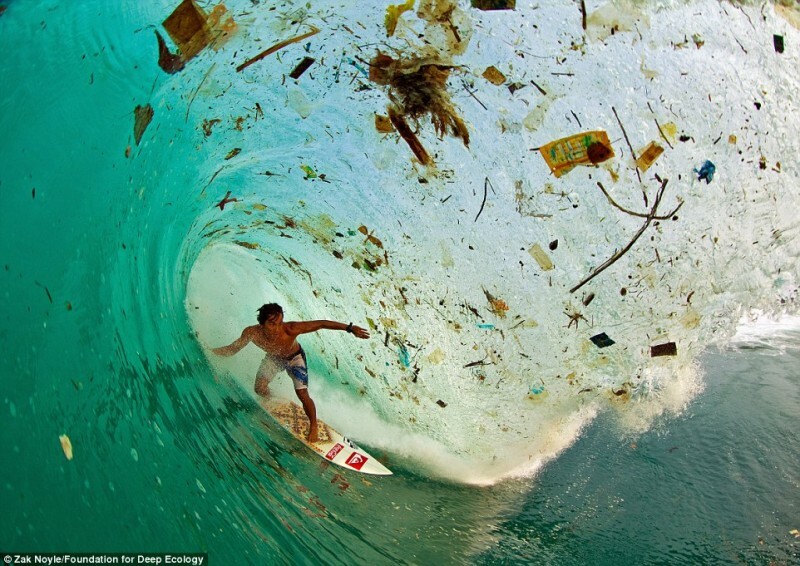 The Indonesian surfer Dede Surinaya rides a wave of filth and trash (Java, Indonesia).